November 9, 2015 Crohnology EditorComments Off on Am I Disabled? People with Crohn’s and Ulcerative Colitis often have symptoms that get in the way of things we want or need to do. But are we ‘disabled’? 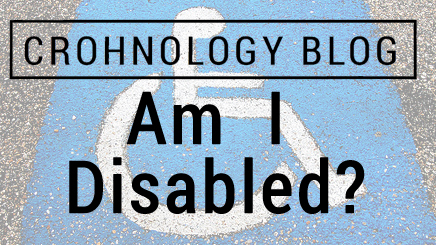 The decision whether or not to self-identify as disabled can be difficult. When I first joined online communities for people with IBD, I found many other people who felt that ‘disabled’ was only for blind people or wheelchair users. Some people thought we were not even allowed to use ‘disabled’ restrooms. It makes sense that some people refuse to let the disease take anything from them. For many people, the stigma of ‘disabled’ is something they do not wish to bear. For a long time, I saw myself as a very able person who happened to have a health issue. But when I finally accepted I was disabled — my disease got too bad to pretend otherwise — I discovered that I was not, in fact, legally disabled. At least, not according to U.S. law. When Congress passed the Americans with Disabilities Act in 1990, ‘disability’ was defined narrowly. Court decisions made the definition even more narrow. When I began to self-identify as disabled, those court decisions meant I was still not covered by the ADA. Life activities includes not only things a person can do — walking, standing, eating, sleeping — but also a person’s bodily functions, including bowel, digestive, and immune system functions. It’s important to note that ‘disabled’ does not mean totally incapacitated, and it never did. What’s more, the law says, “an impairment that is episodic or in remission is a disability if it would substantially limit a major life activity when active.” So even people whose IBD shows no symptoms at the moment are protected by the law — and that’s true whether remission happens from medicine, surgery, or just good luck. The Americans with Disabilities Act offers powerful protection to disabled people; the Amendments were a big step forward in our civil rights. That’s the good news. The bad news is that a lot of online resources have not been updated. Even many government publications still reflect the 1990 law. Some of the rules needed to enforce the 2008 Amendments have not even been written yet. So it can be confusing trying to figure out exactly what protections exist for disabled people. The decision to self-identify as disabled is personal, and difficult for some people. Many of us don’t like to admit the disease slows us down in any way. But under U.S. law, people with IBD can claim the protections and civil rights created by the ADA — whether or not we self-identify as disabled. Photo “Disabled Parking” by Flickr user Taber Andrew Bain modified under CC license. ← Where Is IBD Treatment Going?